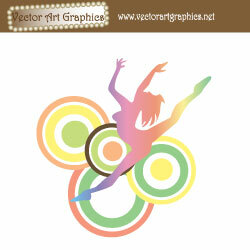 Download the Free Dance Abstract Vector Image. This free vector graphic is available in the AI file format. The EPS file is available via our Vector Art Mega Collection. Attribution is easy! Please link to this website and mention Vector Art Graphics. No attribution is required when you purchase our Vector Art Mega Collection. Pink dancer jumping with abstract circles in the background.